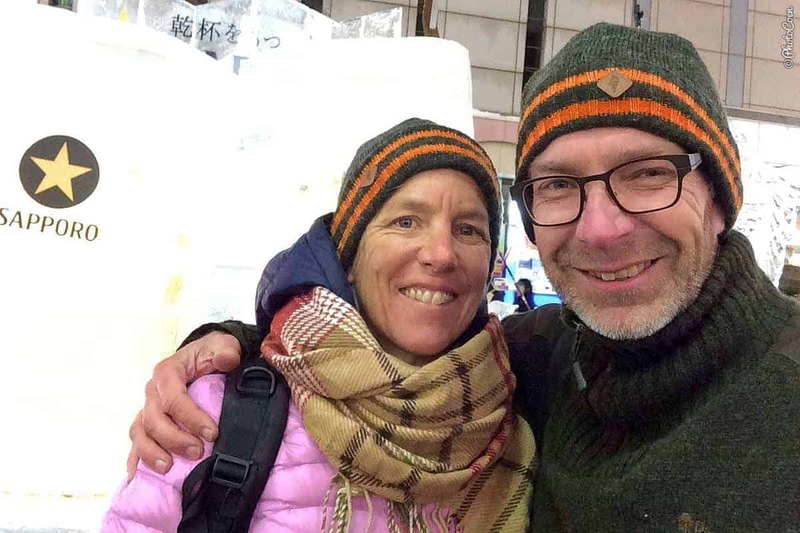 A fellow overlander emailed us recently with the question of how we traveled in the Japanese winter, where temperatures can go down to -30 Celsius (-22F). 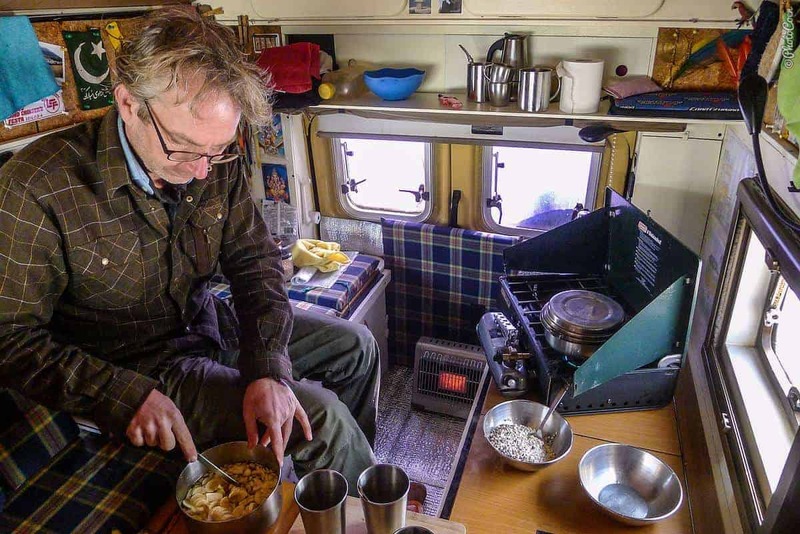 This is a brilliant question, so I decided to dedicate a blog post with tips on how to prepare your overland vehicle for winter. 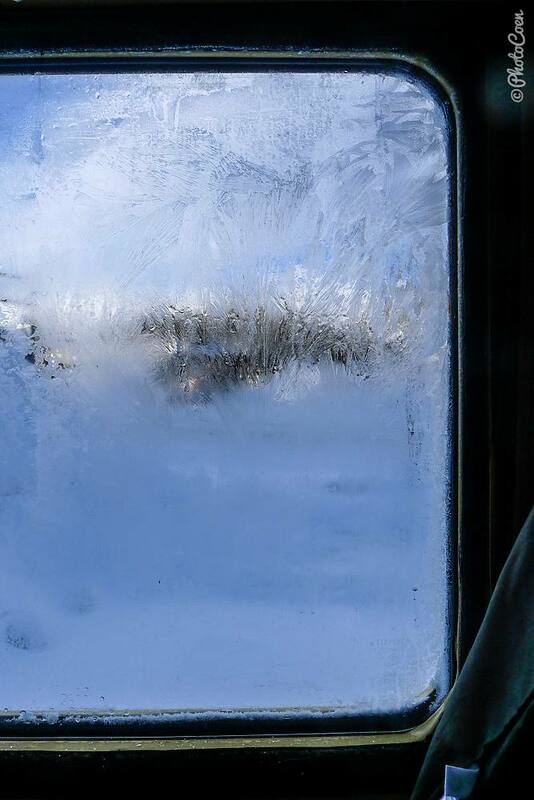 Note that we haven’t experienced a Siberian winter yet – we are about to enter one – which extreme low temperatures may require additional measures than the ones I mention in this blog post. 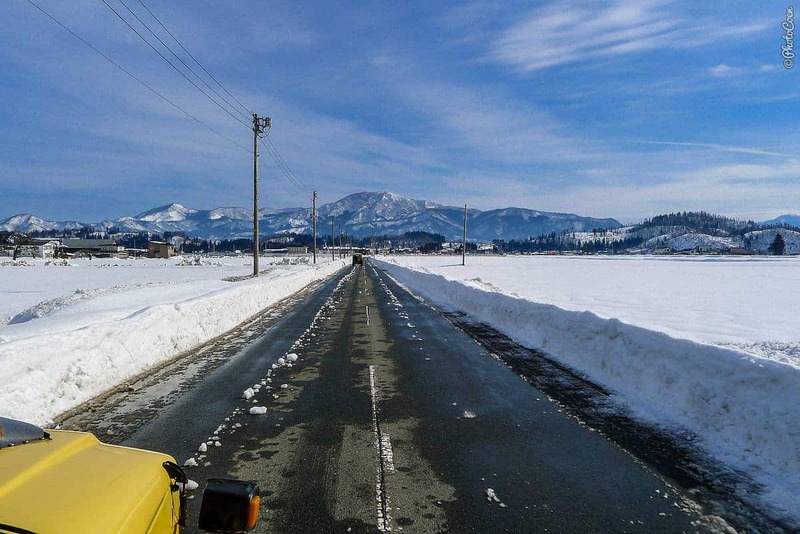 Before I give a lowdown on how we prepared the Land Cruiser, here a couple of general points about winter in Japan. 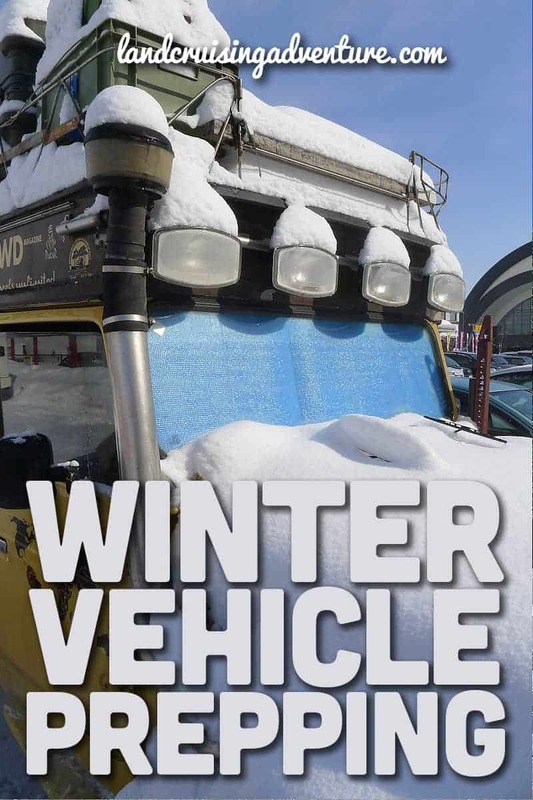 No worries about diesel; Japan sells winterized diesel. It was cold at night, for sure, but never cold enough to take a hotel. We continued camping throughout the winter. In cities we often stayed at michi-no-ekis and in the countryside we rough camped or found a parking lot. 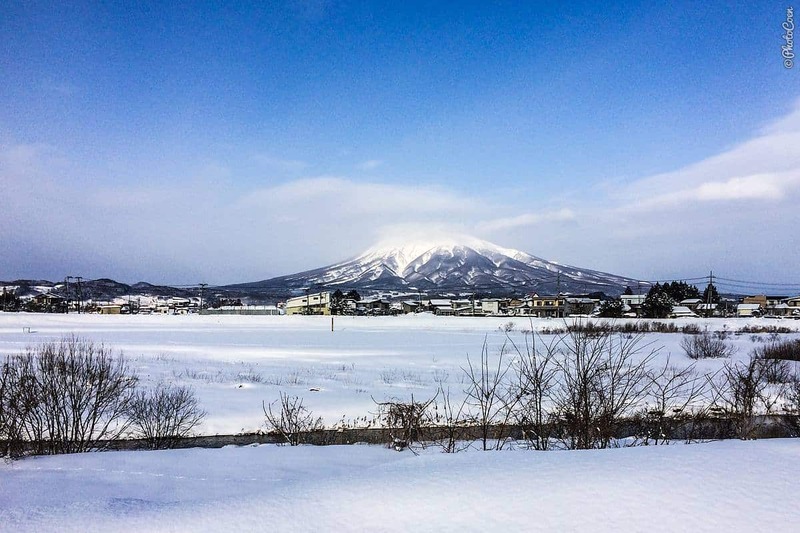 We were on northern Honshu and Hokkaido (Japan’s coldest regions) from late December until early March. While we did have -30 degrees on Hokkaido once, this most certainly wasn’t the standard. Both islands have a lot of snow but most of the time temperatures hovered between 0 and -10 degrees Celsius. The road surfaces are cleared of snow 24/7. That doesn’t mean you will never drive on snow, obviously, there is more than they can keep up with, but the continuous work was amazing to watch. Having said that, the road-clearing is done in urban areas and main roads. Many minor roads, e.g. in the mountains, are closed off for the season. 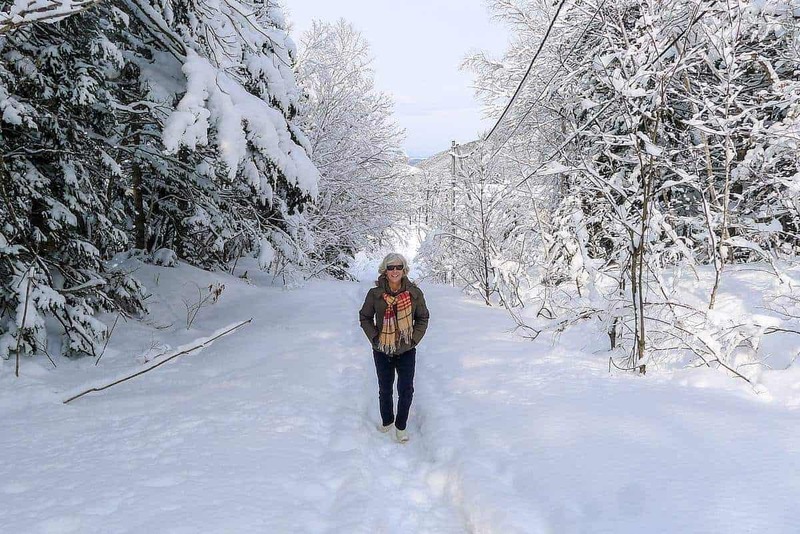 To find deep snow: hike or snowshoe. Another thing that impressed us was the arrows above the road. 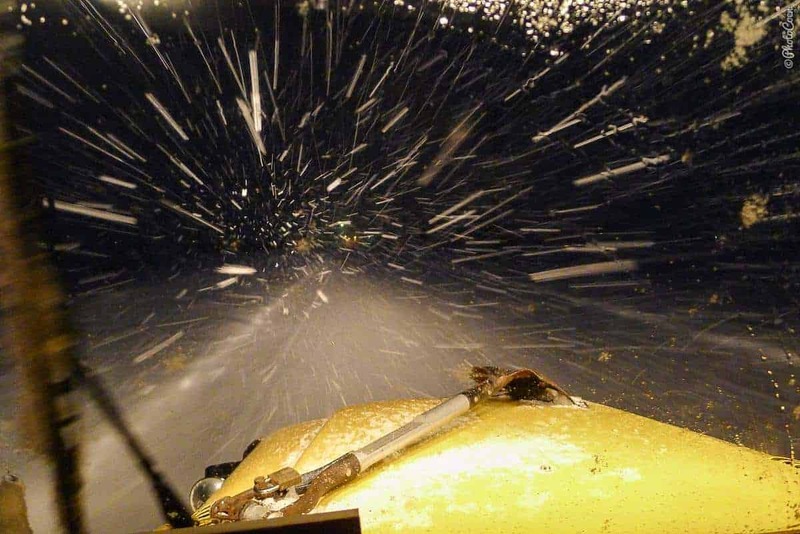 We didn’t understand their purpose until we were hit by a snowstorm when driving in the middle of nowhere. Within minutes the whole world became one terrifying white blur in which we could no longer distinguish anything at all. The arrows lit up, clearly indicating the side of the road. What a simple but super effective safety measure. 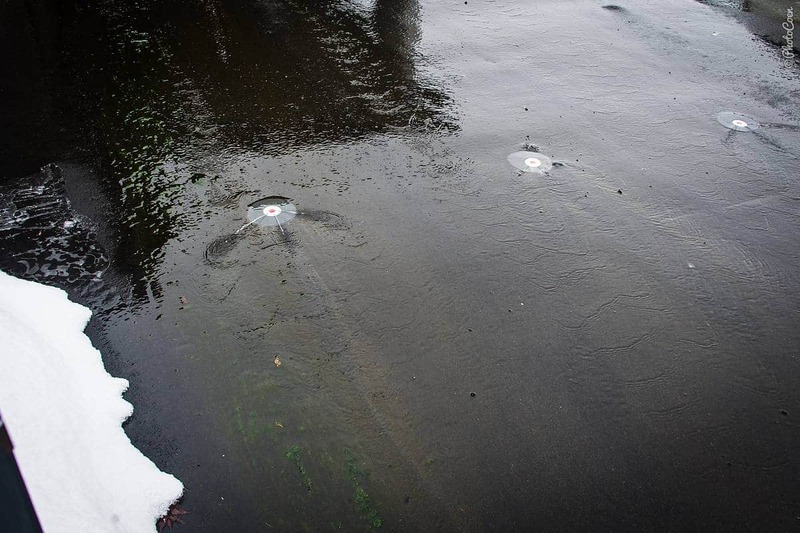 In some roads they have a nifty system of running water so the surface doesn’t freeze up. 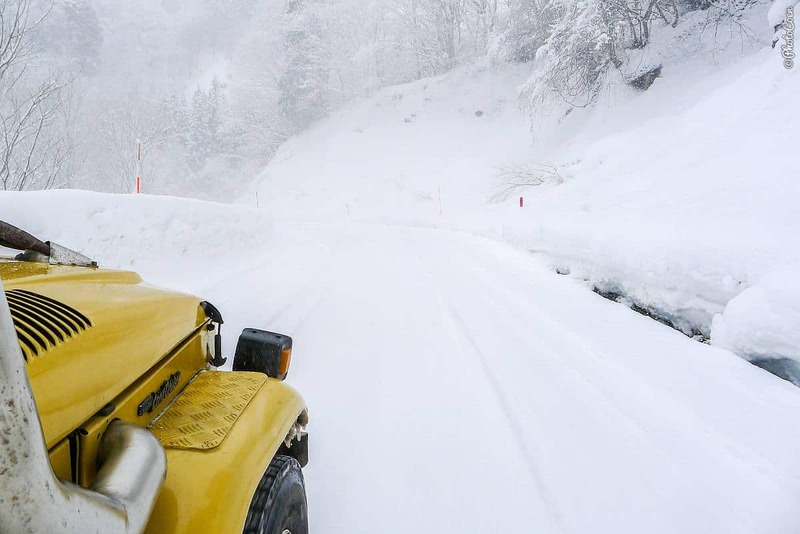 Before detailing the specific measures you can take to prepare your vehicle for overlanding in winter in Japan, let’s take a look at a couple of simple things you can do when temperatures go down and summer outfits no longer suffice. From the beginning of our journey we each carried a set of thermal underwear. We fell for Merino wool undergarments and are now ambassadors of Armadillo Merino. Especially their long-sleeved shirts and long johns have done a marvelous job to shield us from the cold. In Japan I slept in them but also wore them on cold days as an extra layer. Additionally, we have some good clothes given by Pinewood, among which long trousers, sweaters, and woolen hats. Coen pretty much lived in this comfy outfit from Pinewood. A warm jacket, second-hand for $5 it was a great buy! Small as the Land Cruiser already is as a home to live in, we made it even smaller to concentrate the heat in the rear where we sit and sleep. 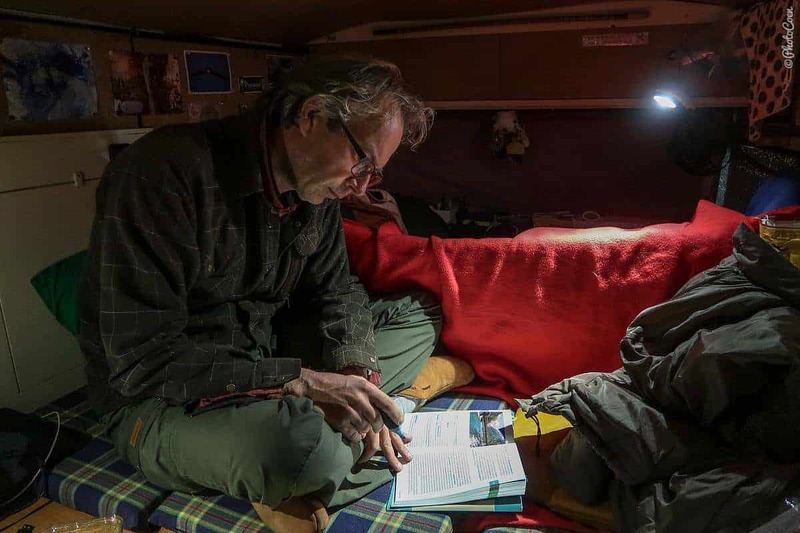 We place planks in the middle section (like we do when making the bed) which helps to keep the heat in the higher part of the Land Cruiser and the cold below the planks. Another cold section is the front of the car, which isn’t insulated. We hang fleece blankets between the back of the front seats and the rear section, which also helps to keep the heat in the rear of the car. We usually sleep under a down blanket. We also have Big Agnes down sleeping bags that we use for hiking. In winter these sleeping bags double as a second layer on the down blanket. 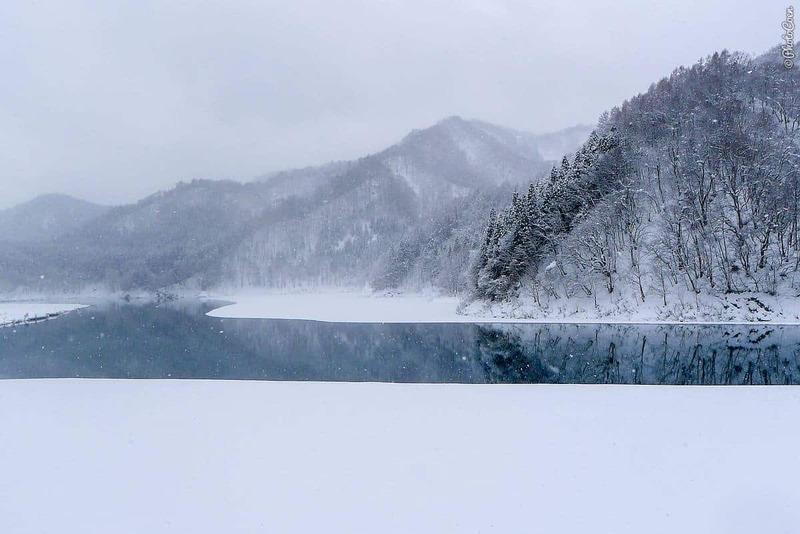 However, for winter in Japan, all these basic measures didn’t suffice. This is how we prepared the Land Cruiser. We bought snow tires because ‘everybody’ told us we’d need them up north. ‘Everybody’ in Japan is driving on studless tires so we figured they must be right. And yes, it was a good decision. 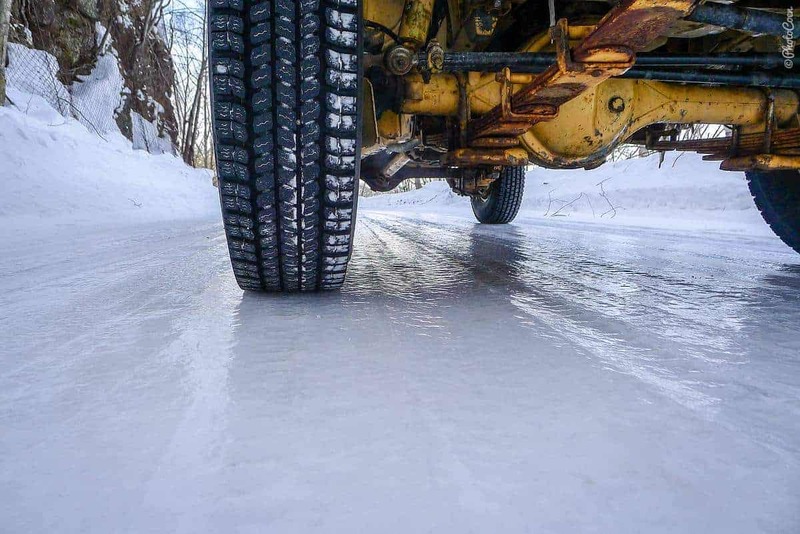 These studless tires have a super grip on the snowy roads and they got us everywhere, including on slippery surfaces. We never used snow chains and didn’t carry them in the Land Cruiser. In some areas, however, people do use them at times. 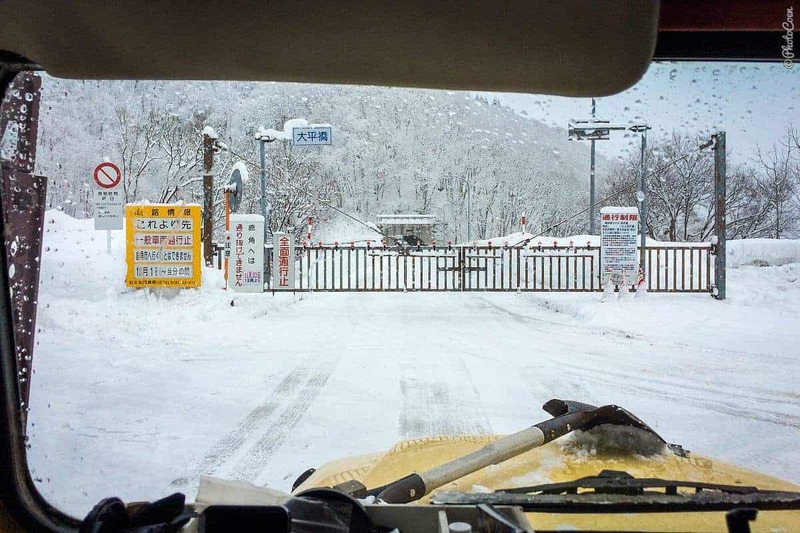 On both ends of the mountainous regions are dedicated parking lots to put them on or take the snow chains off. Maybe we were just lucky not to be needing them and not being caught in the mountains during snowfall. 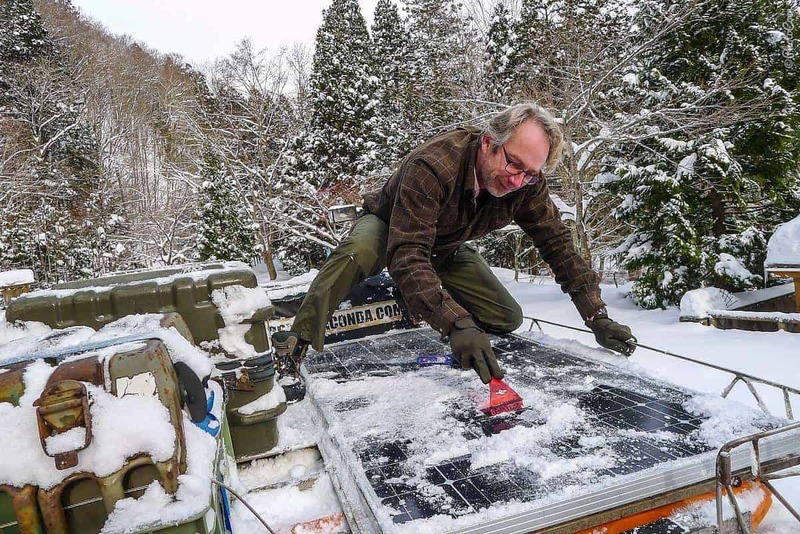 Our Land Cruiser is insulated pretty well, meaning there is insulation on the sides and the ceiling, and the floor is covered with a thick wooden plank. But this wasn’t enough for the freezing temperatures in Japan so we bought reflective foam insulation. We put this insulation on top of the wooden floorboard, under the front seats, against the back doors, and we cut pieces that we put in front of the windows at night. We have a 100-liter water tank underneath the Land Cruiser. Obviously this and the tubes would burst in freezing temperatures so we closed the whole system off and bought a 20-liter jerrycan with a tap. 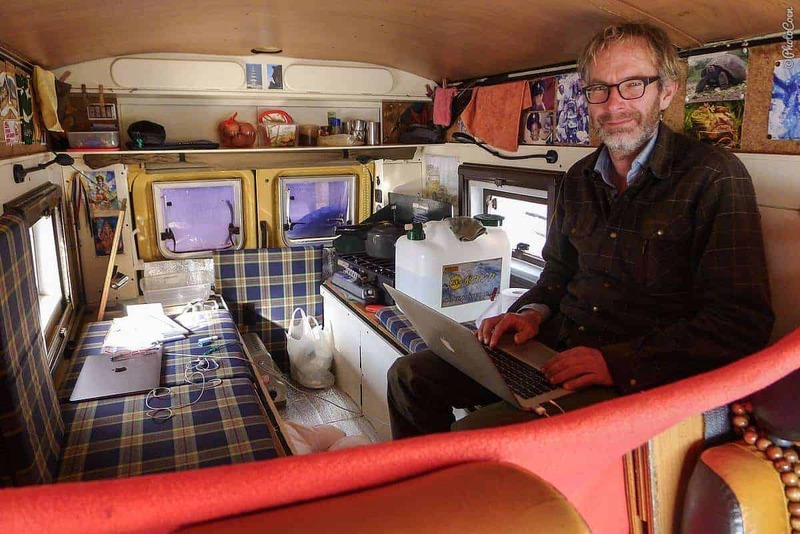 Floor insulation and a small gas heater… just perfect. 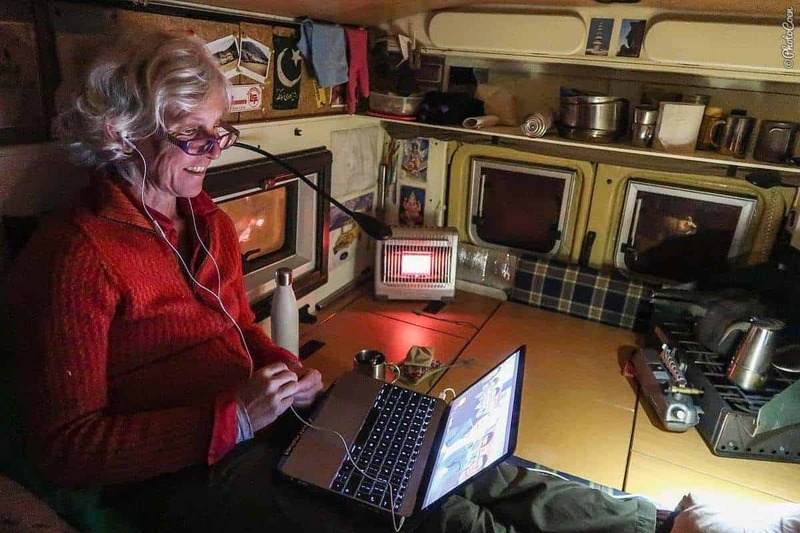 We have the regular heater when we drive but we don’t have an integrated heating system that we can use when we are not driving, such as Webasto. In Japan many people leave their car running when parking, including when they spend the night sleeping in a parking lot, but we didn’t want to do that. For our winter in Japan we bought a small gas heater. The elongated, butane gas canisters often come four in a pack, which you can find in many supermarkets, hardware stores, and – if I remember correctly – convenience stores. They work fine but don’t forget to ventilate. They eat oxygen. 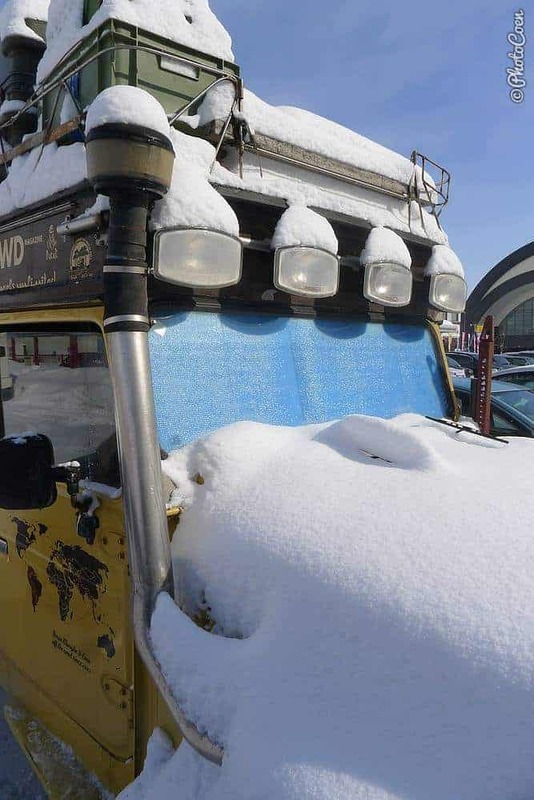 We used them daily but for short periods of time because it creates lots of condensation and it just didn’t feel healthy to be in that intense heat all the time (in our small vehicle it was hard to regulate it to a pleasant temperature). Sometimes these gas cans need a little preheating because butane doesn’t work well at temperatures around zero. So I kept one next to my bed and put it under the blanket ten minutes before getting up. Not for the Land Cruiser but for ourselves were these heat packs. Convenient in your shoes when you go for a hike in the snow or go sightseeing, nice to have a warm pack in your back when you go to bed. You shake the heat packs to activate them and depending on the quality they stay warm for a number of hours. In Japan they are popular and we found the one-time-use heat packs in hardware stores, supermarkets and convenience stores. Having said that, the environment will be grateful if you use reusable heat packs. Heat packs in my boots. 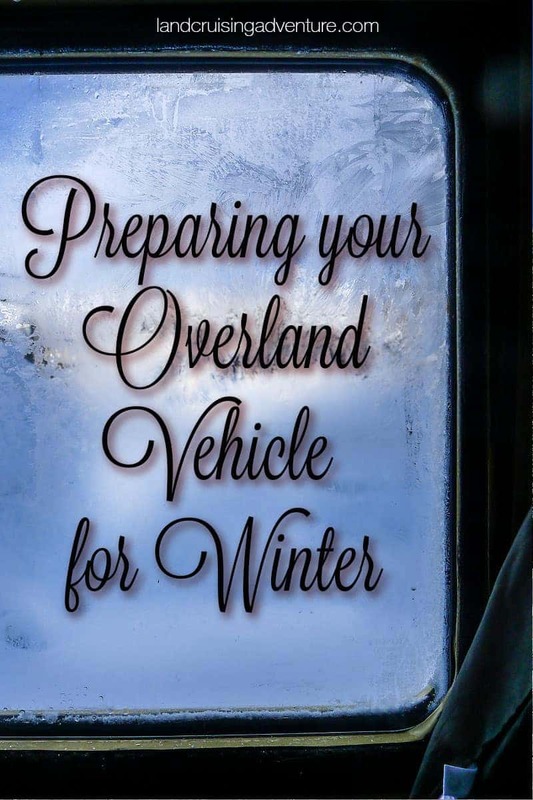 I hope this helps to prepare your overland vehicle for winter. 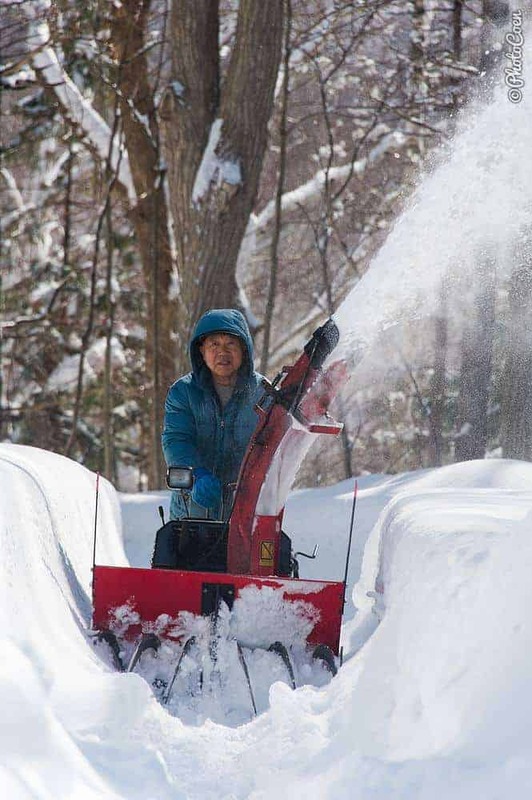 Let us know if you have any questions and share your winter experiences with us. We’d love to hear them! Enjoy the onsens – saunas that you will find throughout Japan. The majority are indoor facilities, varying from one-dollar simple ones up to expensive spa-type of onsens. Take hot-water foot baths. 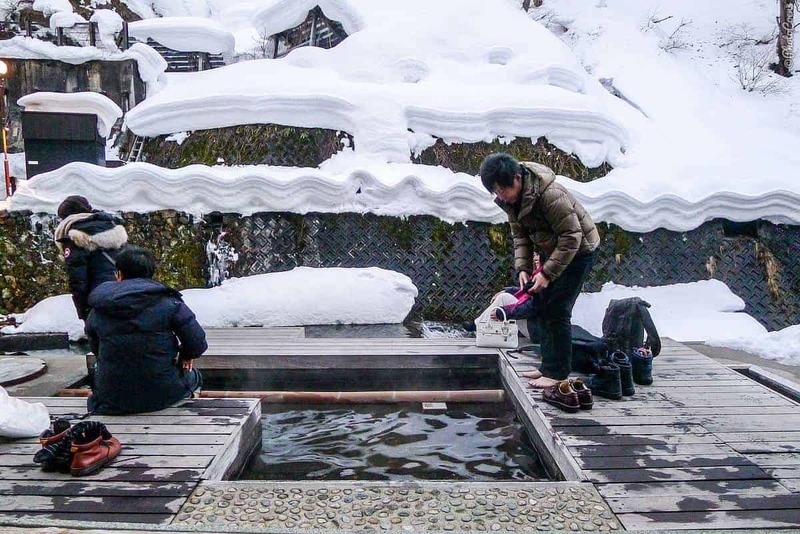 You’ll come across these outdoor baths in towns, parks and sometimes as part of a remote michi-no-eki. 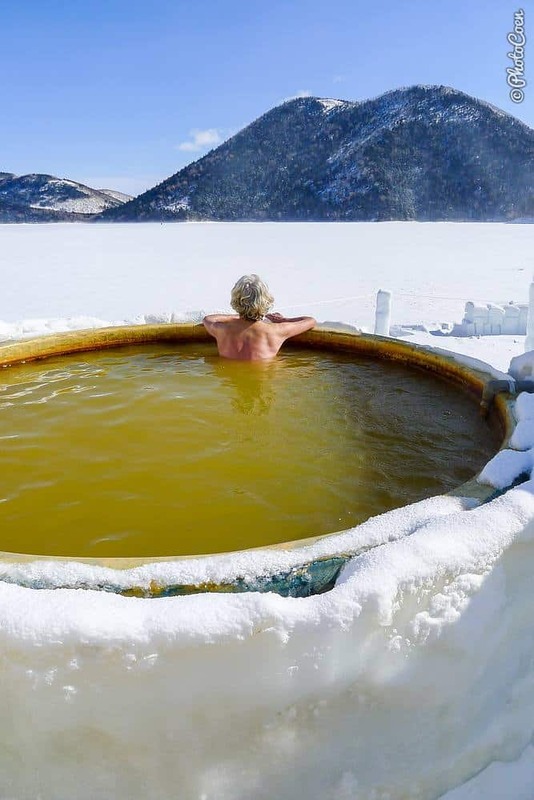 Take off your shoes and socks and soak your cold feet in the blissfully hot water. Eat Japanese foods. 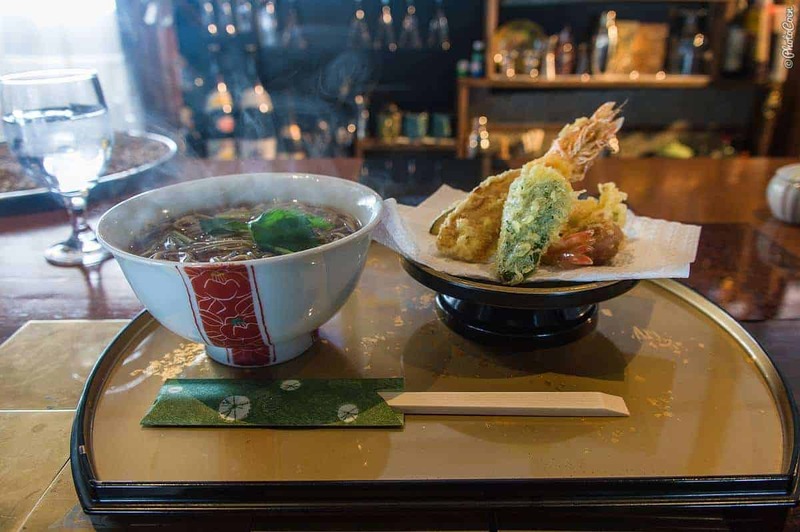 Soups are excellent foods for winter, and Japan has plenty of those. Try, for example, to make your own version of Japan’s miso soup. Outdoor onsen in the middle of nowhere. By purchasing a Landcruising Adventure T-shirt we can keep this website online and continue sharing the wonderful vibes of overlanding. Thanks and enjoy the ride. I’ve been able to keep myself warm winter camping. My problem has been my 4x4s. My gasoline engine vehicles didn’t like the cold, but they started. However my Chevy diesel truck doesn’t start in very cold temps. It has to have it’s electric heater plugged in. Which of course isn’t possible in remote areas. 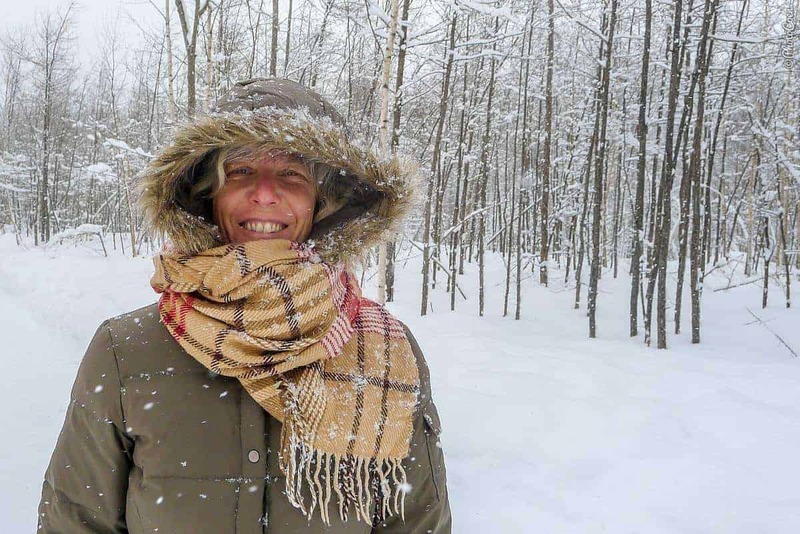 As usual I enjoy your photos, and it was nice to see the winter ones. 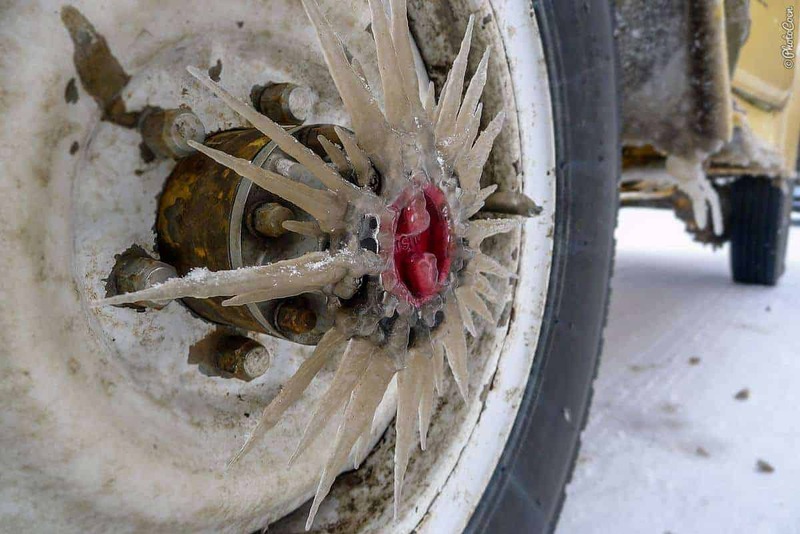 The photo of the tire on the icy road almost had me slide off my chair! Heya John, thanks for chiming in. Yeah, that tire shot had me almost flat on my face. When I pulled the handbrake and stepped out, I slipped instantly. I could barely grab the door and floorboard to prevent further damage. I had to grouch on fours to take the shot and locked the hubs for good measure and drove off in low gear. Mind you this was a 6% incline! I love the idea of running water to prevent freezing. How clever the Japanese are.